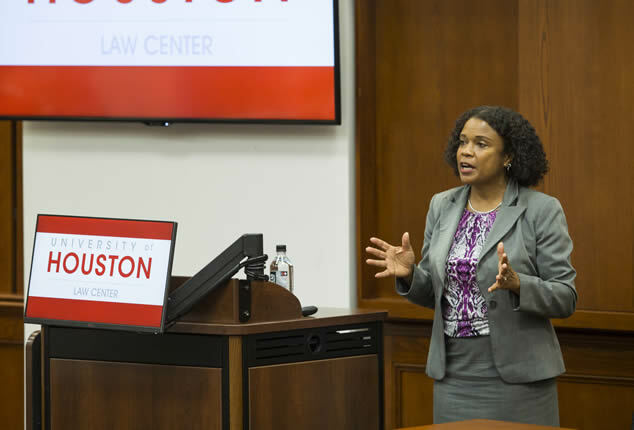 Judge Eleanor Ross of the United States District Court for the Northern District of Georgia '94 returned to her alma mater as a speaker in the Sondock 2017 Judge Ruby Kless Sondock lecture series last week at the University of Houston Law Center. Oct. 31, 2017 -- Judge Eleanor Ross of the United States District Court for the Northern District of Georgia said attorneys must practice a code of respect when deliberating in the courtroom during her lecture as part of the Justice Ruby Kless Sondock Jurist-In-Residence Program last week at the University of Houston Law Center. Ross a 1994 graduate of the Law Center, noted that she has seen occasional instances of attorneys displaying a lack of civility. "In my mind the courtroom is sacred ground," Ross said. "Over the years I have developed a strong opinion that there are certain things you dare not do, say or wear in a courtroom. The decline in civility that I have seen in the cases that have been handled before me have been very disheartening." Ross said she has not seen egregious behavior in her courtroom, but an increase in condescension, sarcasm and other forms of demeaning behavior by attorneys. "Key elements of civility include dialogue, respectful communication and informed public decision making," she said. "The short definition that I often use is a code of respectful behavior within the legal community. "I like to distinguish civility from the broader category professionalism. Professionalism encompasses so much like competency, remaining knowledgeable about the laws and the rules governing the practice of law, and the judgment you use. Civility is a component within professionalism – that component deals specifically with the interaction of the players involved in the legal process." Ross noted that while lawyers should always maintain proper behavior, the spirit of courtroom debate should remain competitive. "Don't hate to disagree. This is an adversarial process. It's not about agreeing on everything, it's about showing respect." In his welcoming remarks, Dean Leonard M. Baynes referenced a new LED display near the Hendricks Heritage room that showcases previous Sondock Jurists-in-Residence and Law Center alumni who serve as judges. "One of the beauties of this program is it brings judges from all over the country to lecture," he said. "We're very proud of our alums who are judges. We want to honor all those who are Sondock Jurists-in-Residence, whether they're our alums or not, and all of our alums who are judges. "It's a great way to instill in our students the virtue of public service and to get them to think about being judges. As dean, one of my focuses is that our students aim for the skies — I want them to be law clerks, I want them to be judges, I want them to be on the Texas Supreme Court, the Federal Circuit Court and the U.S. Supreme Court." The Jurist-In-Residence program is named in honor of Justice Ruby Kless Sondock, a trailblazer in the law who graduated as valedictorian and one of only five women in the UH law school class of 1962. After practicing law for many years, Sondock was appointed to the 234th District Court in 1977, making her the first female state district judge in Harris County. She was appointed to the Texas Supreme Court in 1982, making her the first woman to serve in a regular session of the court. She was proclaimed a "Texas Legal Legend" by the litigation section of the State Bar of Texas in 2016. The next speaker in the Sondock lectureship is Judge Gregg Costa of the Fifth Circuit Court of Appeals. The speaker prior to Ross was Judge Jenny Rivera of the New York State Court of Appeals.